Among the thousands of pilgrims and visitors present in St Peter’s Square for the Pope’s general audience on Wednesday was a group of Anglicans from all over the world who are taking part in a week long study course on Christian leadership. Participants from the United Kingdom, Australia, New Zealand, the United States, Nigeria and Myanmar were among those attending the audience, while the director of the Anglican Centre, Archbishop David Moxon and Zambian Bishop William Mchombo of the Central African province were also able to exchange a few words with Pope Francis. 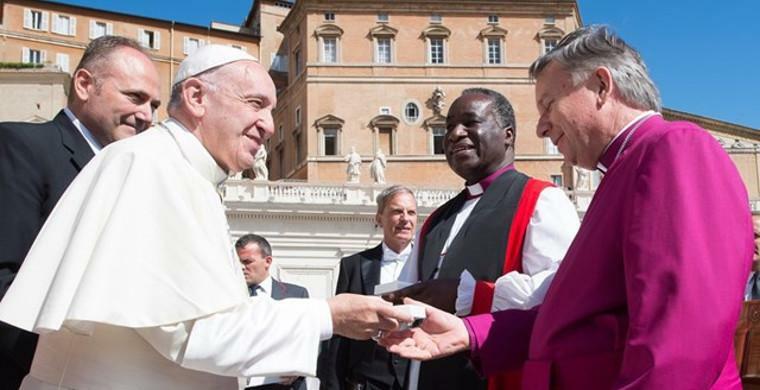 “Bishop William was delighted to be able to bring greetings from the Anglican community in Central Africa”, Archbishop David told Vatican Radio, adding that the Pope said how much “he values our prayers”. The director of the Anglican Centre, whom the Pope invited to give a joint blessing at the close of Vespers marking the end of the Christian Unity week in January, said he was also thrilled by the enthusiastic greeting he received from the Holy Father. Noting that he celebrated his 65th birthday on Tuesday, Archbishop David said “it really meant a lot to me to be so warmly embraced by him”.